New site achieves real time inventory, order tracking, and ERP integration. Website Pipeline, a Greenville, SC based web development firm, recently launched a new cloud based ecommerce website for Allied Bus Sales. 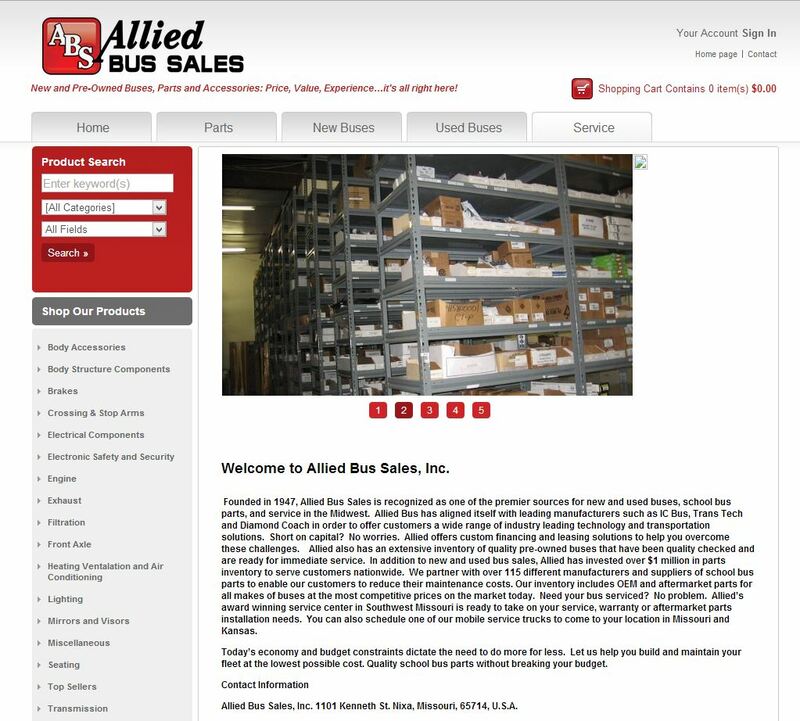 Allied, one of the largest Midwestern bus distributors, now boasts an ERP integrated website that offers an extensive inventory of new and used buses as well as an on hand inventory of parts from over 115 manufacturers. Keeping inventory up to date in both the ERP and ecommerce site can be a challenge, but with Website Pipelines’ fully integrated ERP ecommerce platform, life just got easier. ERP ecommerce website integration means data is shared between the ecommerce site and the enterprise resource software keeping both systems up to date. Allied bus sales employs the Sage 300 ERP to manage their business, and their goal was to build a site that integrated with the ERP software, the Sage Payment Services, real-time inventory, order tracking, and competitive pricing. AXIS Integrated Solutions, the St. Louis based Sage Business Partner that manages the Allied Bus account for Sage, brought Allied Bus to Website Pipeline because they needed a fully integrated solution that was as close to turn key as possible and that required very little setup or intervention from the Allied team for technical site design. Allied’s Director of Operations agreed that Website Pipeline was a great fit for the project and everyone involved worked to achieve Allied's goals. Website Pipeline begins any relationship by asking questions and understanding the business model, the customer, the product and the purchase cycle. This, along with their extensive knowledge of ecommerce and ERP systems, provides the client with a realistic scope of work and a plan that will meet the business’s goals. With well over one thousand website launches completed, Website Pipeline has developed a rapid deployment system for getting the site up, running, and taking orders in thirty days. With a long history in the Midwest, Allied began back in 1947, and not only sells new and used buses but offers a tremendous on-hand inventory of OEM and aftermarket parts. This, in conjunction with in-house and mobile service departments, rounds out the offering. Their new website addresses the needs of each of the four different types of customers in one place. To learn more about Allied Bus Sales visit the new site at www.alliedbussales.com. Website Pipeline designs, builds, hosts and supports ecommerce websites featuring real-time, bi-directional integrations with popular ERP systems for both B2B and B2C product based businesses. To learn more about the company visit www.websitepipeline.com.